This story follows newly divorced Eden Elliott, an aspiring romance writer, who has traveled to the quaint village of Glenkillen, located in the lush highlands of Scotland, for what she expects to be a quick trip to gather some local color to add authenticity to her writing. On the plane, she meets another American, Vicki MacBride, traveling to the village for her father’s funeral and before she even gets to the village inn, her rented car breaks down and she is rescued by the ruggedly handsome and charming Leith Cameron. 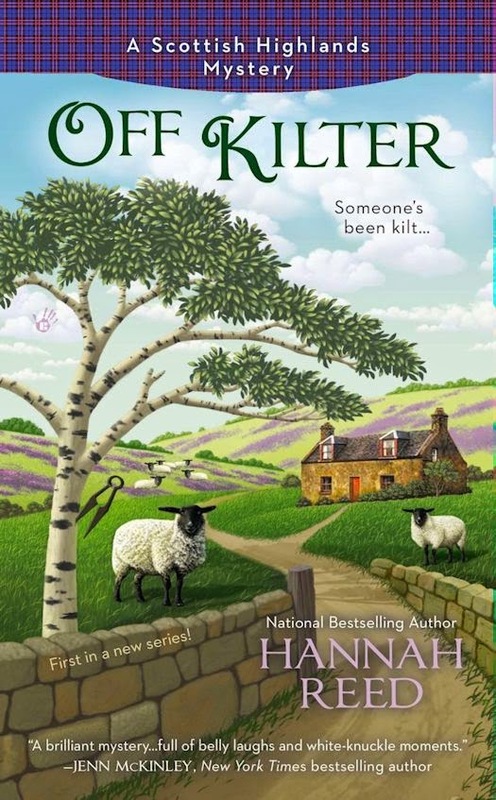 On a whim she attends the funeral and wake for her new acquaintance’s father and stumbles upon the body of the local sheep-shearer, who has clearly been murdered. From then on she is on a whirlwind of close calls and confusing experiences all while trying to get her name and that of her new friend off of the suspect list and keep herself from being another victim. Eden is a wonderfully strong and independent character who is a little lost at this point in her life. Her marriage is over and she has recently lost her mother after a long and debilitating illness. Her friend Ami is a successful romance writer who is trying to push her friend out of her comfort zone and into something adventurous. She has no idea just how adventurous the trip to Scotland will be in the end. Ami was a fun character, creating a good contrast to Eden’s reticence, but she has a very small supporting role in this book. Vicki becomes very prominent to the story right from the first time we see her on the airplane. She is kind hearted and sweet and possesses the gift for gab that can sometimes exhaust the reserved Eden. Leith is the perfect romantic hero for Eden. He is classically handsome, in the rough hewn Scottish way, and comes off as a genuinely nice guy. There are a mass of other characters that provide humor and local color. Most notably, Detective Inspector Jamieson and his bumbling sidekick, along with Vicki’s estranged family, who are doing everything they can to make sure Vicki, and by default, Eden know they are not welcome in the close knit community, and multiple villagers who provide both comedy and realness to the story. This is a perfectly done cozy mystery. The author does a wonderful job of capturing both the beauty of the Scottish highlands and the undercurrents present in a small village. The characters are well drawn and so realistic, you find yourself really rooting for them. The mystery is complex enough and fast paced and Eden provides a wonderful point of view through her slightly cynical eyes. The romantic tension between Eden and Leith is subtle but builds as the story progresses. The plot is well thought out and executed perfectly and the denouement is very satisfying. Hannah Reed is also the author of the Queen Bee Mysteries. I have not read any of those, but certainly plan to change that. I enjoyed the snappy style Reed used in this novel and imagine I will like her other books as well. Of course, I will be looking for the next installment in the Scottish Highlands Mysteries. I am very interested in seeing where the story goes and am looking forward to reading more about Eden and Leith.